You may sponsor a university to research on a specific industry to boost the city’s competitiveness rating of the selected industry. 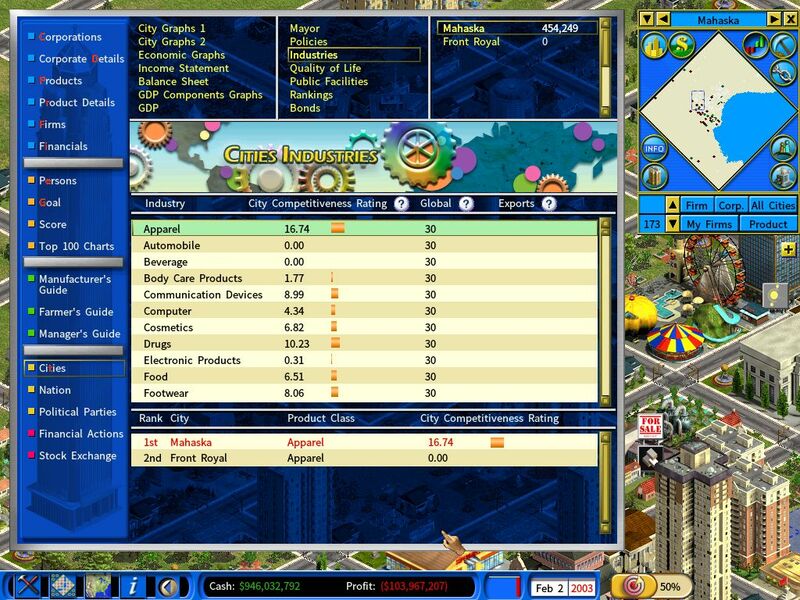 You can view a city’s competitiveness ratings on different industries from the Industries section of the Cities report. The city’s Competitiveness Rating of the industry. The higher the city’s competitiveness rating, the larger number of people are employed in the local industry. When the city’s competitiveness is weak, it will have to import large volumes of goods, hurting employment in the manufacturing sector. The Global Competitiveness Rating of the industry. When the city’s competitiveness rating exceeds the global competitiveness rating, the city will be in a position to export its products to the worldwide market. The city’s volume of export of the industry. There will be export when the city’s competitiveness rating exceeds the global competitiveness rating. Strong export will improve the city’s employment significantly. University Research leads to higher competitiveness to certain industries, boosting the city export of products in those industries. The city’s “local businesses” benefit from increasing competitiveness and export, thus hiring more workers and decreasing the city’s unemployment rate. A lower unemployment rate and more job openings will attract more people to migrate to the city. Note that this is not an immediate effect. Only when the city’s competitiveness exceeds the global average when you start to see the result. It may take months or even years. And the impacts will become more obvious when competitiveness of many product classes far exceeding the global average. 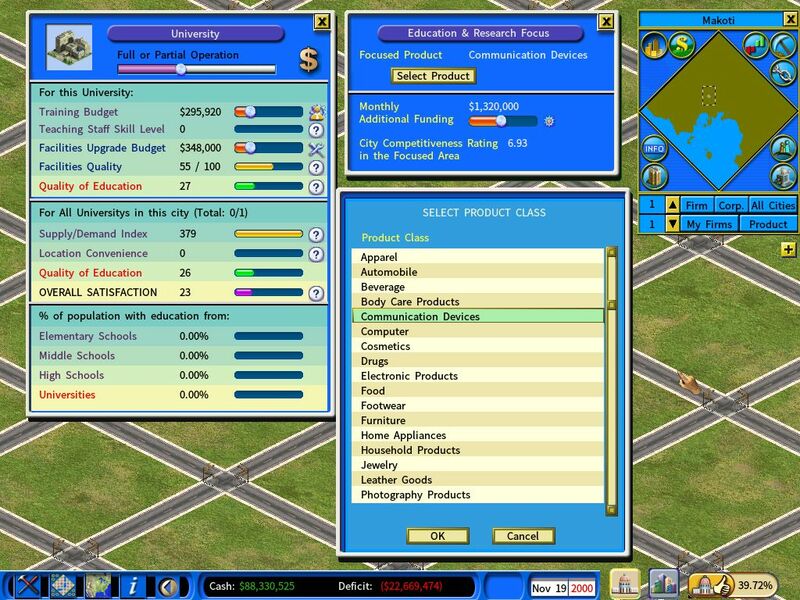 You can view the education levels of people in a city by clicking on any civic buildings related to education, such as the screenshot shown below. 1) How fast a city’s competitiveness in a specific industry increases. 2) The skill level of the staff in a civic building. 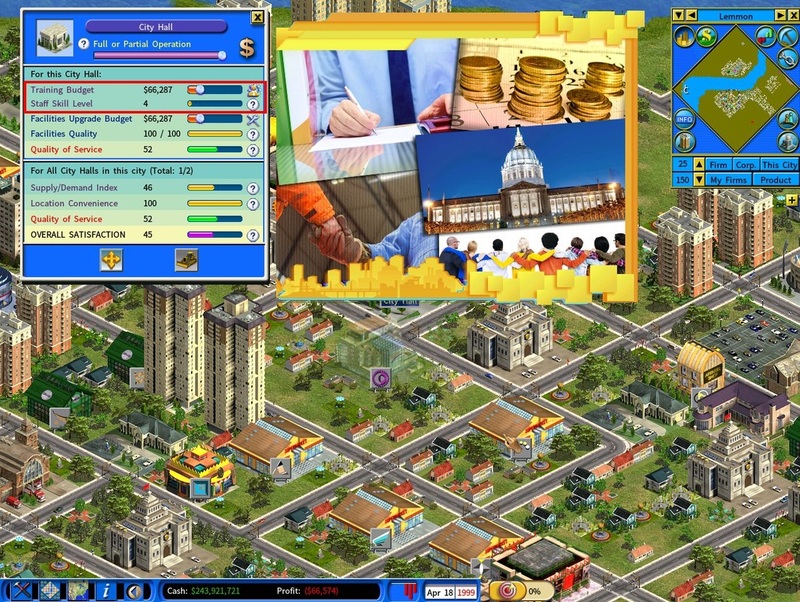 The staff skill level, as shown in the following screenshot, is determined by the education levels of people in this city and the staff training budget for this civic building.